"American Horror Story was a show that took me by surprise. 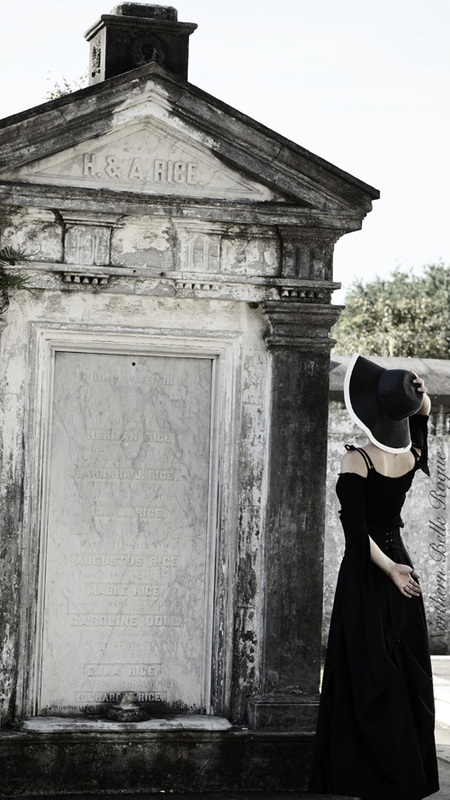 The first season still remains my favourite to date, but American Horror Story: Coven, is a close runner up. As someone who is pagan it can be hit and miss for me when watching the representation of "witches" in Hollywood. 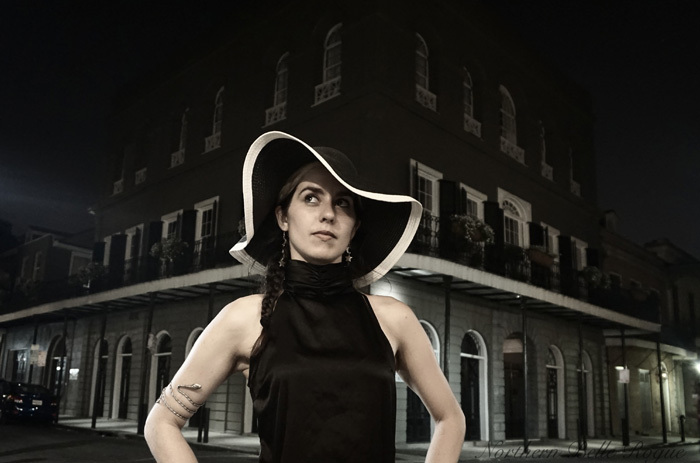 However, as a girl who had been obsessed with New Orleans since I was a small child (thank you, Interview With A Vampire) and a huge history buff / haunted walk tour guide, the fact that some of the characters were based on real women made it that much more exciting. To be clear, I'm not saying that AHS had an accurate depiction of events but rather that it was a fun show to watch and research the history of later. 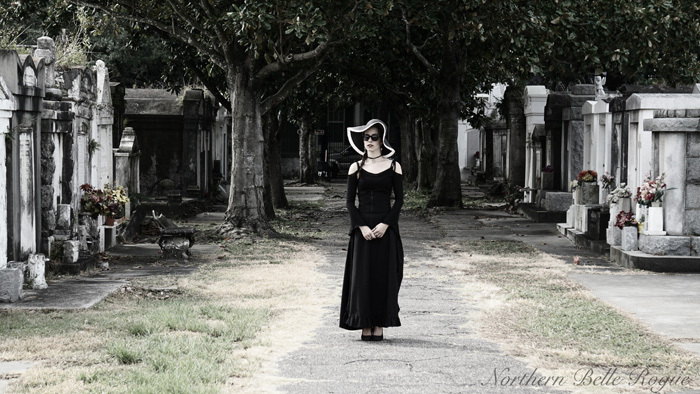 Two of the major characters in this season Madam LaLaurie (portrayed by Kathy Bates) and Marie Laveau (portrayed by Angela Bassett) are key figures in New Orleans history. So, this summer when I had the opportunity to travel to NOLA I knew I had a few key destinations to hit. 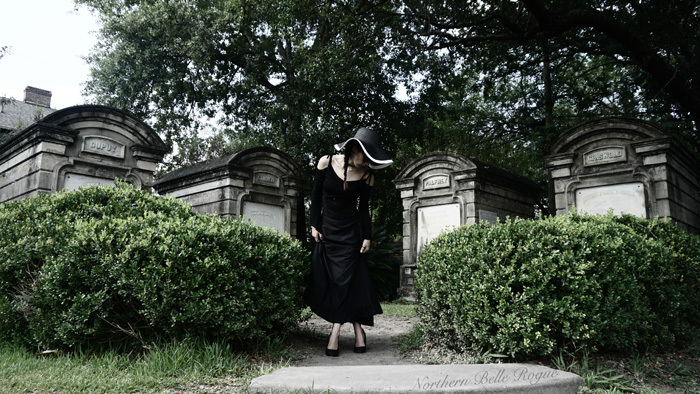 While doing so, I decided that I would don clothing inspired by American Horror Story: Coven. Particularly the scene where Fiona takes the four young witches for walk about town dressed in all black with accents of white. 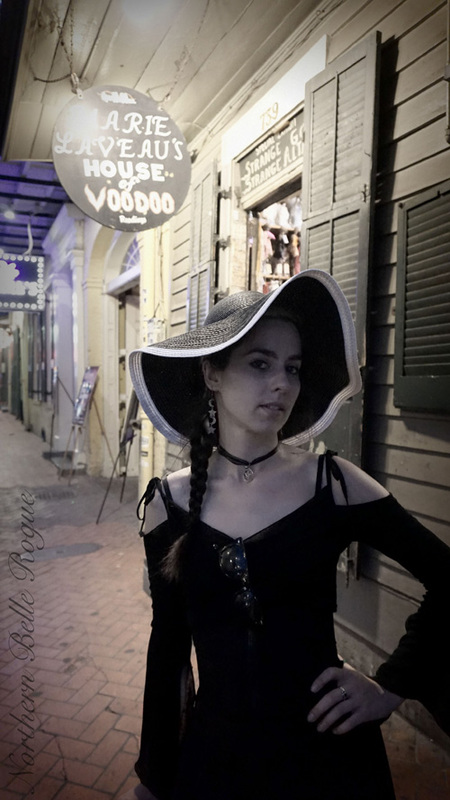 Of course we visited Marie Laveau's shop which remains on Bourbon Street, it was a beautiful mix of different magics, spells chalked out on the floor, altars adorned with offerings and in the back, three displays in homage to Voodoo from New Orleans, Africa and Haiti. No photographs are allowed inside, but I did manage to get one in front of the shop. While there are many things for purchase here, locals will warn you be careful what you touch while in the shop. Personally, I'd rather be superstitious than haunted and so I kept my hands to myself. The LaLaurie Mansion on the other hand no longer accepts visitors and is closed to the public. Once owned by Nicolas Cage amongst others there was a time when people could wander in this house of horrors. 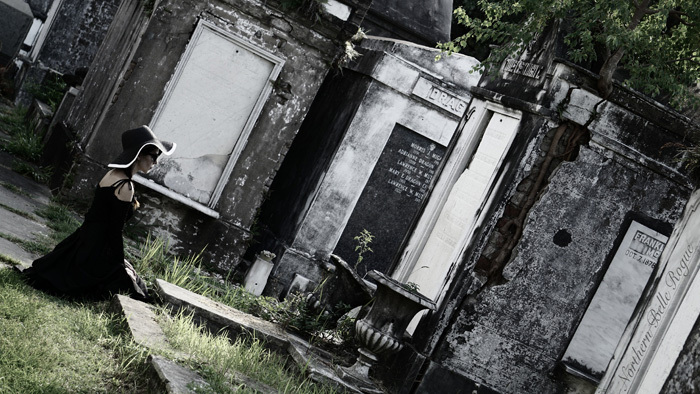 Of course LaLaurie herself and her history is still widely disputed, yet the mansion remains one of the prime stops for those who are supernaturally inclined. When we took our haunted history tour, this was the last stop and we were by no means the only tour group there. We did not unfortunately get to see the cemetery behind St. Louis Cathedral where Marie Laveau is buried. 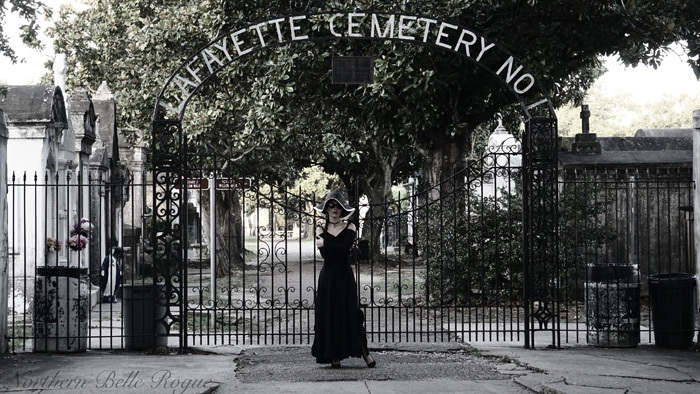 Instead we opted to visit Lafayette Cemetery the film set for Interview With a Vampire, Vampire Diaries & The Originals and Dracula, amongst many others. This cemetery is old and beautiful, although only open to the public from 8am-3pm due to new legislation despite what signage says. My favourite aspect of this cemetery was the natural magic happening all around us. We walked around the perimeter of the graveyard and you could see nature ignoring man made creation in favour of life. The walls were bursting with plant life! 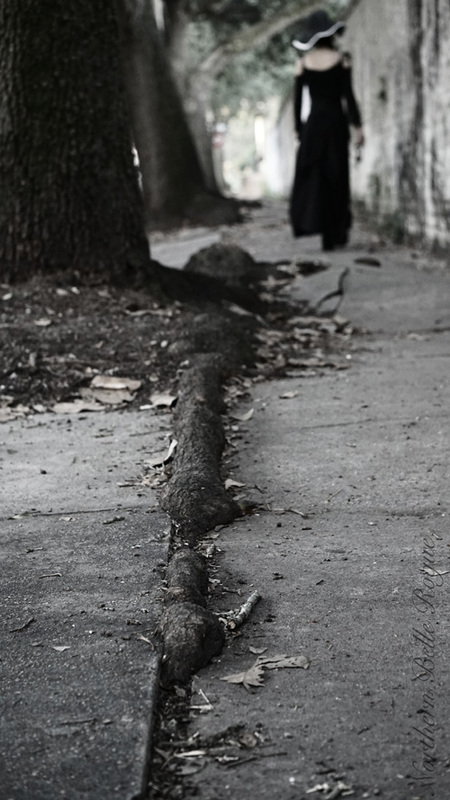 The side walks were uneven at best as tree roots erupted through the cement. In fact my favourite tomb in the whole area was one in which you could see the tree growing out the top, reminding me of something from Ferngully. Pieces of the stone work had collapsed and fallen and the roots of the tree were exposed creating a wonderful juxtaposition of warm life and cold death. Of course I couldn't visit this place without seeing the Rice family tomb. Anne Rice inspired me as a child, Interview with a Vampire was one of the first novels I ever read. Additionally the movie swept me into a world of darkness and magic that left me itching to visit this beautiful city - to see the moon over Bourbon street at night. All in all it was a magnificent experience and a beautiful city. I hope y'all enjoy the photo set that we managed in spite of the roaring heat. I would most definitely want to visit New Orleans again, and hope I can do so in the near future. For those of you fond of Vampire fiction, Hollywood witches and a city soaked in history I highly recommend you travel to this destination."